Building performance analysts and LEED accredited architects devoted to sustainable design. We are Kirksey EcoServices - an in-house team of building performance analysts who specialize in green building solutions. We design, study, and advocate for spaces that respond to their site and climate, use resources efficiently, and prioritize the health and well-being of occupants. Green buildings are less expensive to maintain, more marketable, and filled with happier and more productive occupants. We’re passionate about spreading this message and helping our clients reap the benefits. We are one of the most experienced teams of green building experts in the state, dedicated entirely to the study of sustainability. 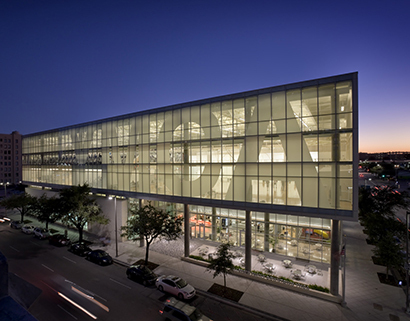 We are founding members of the Houston Chapter of the US Green Building Council, and we designed many of Houston's first LEED buildings, including the first LEED certified building, the first LEED Gold, and the first LEED Core and Shell building. Our team is also one of only a handful in the country designated by the USGBC as a LEED Proven Provider, a distinction that allows our projects a faster, more streamlined path to LEED certification. Our award-winning team is led by Julie Hendricks, an architect, green building consultant, and LEED Fellow with 20 years of experience. Julie is responsible for making 7 million square feet of projects more sustainable and has saved 2.6 million MBTU's energy through her advocacy efforts. The Kirksey EcoServices team boasts several other leaders in their field. Kapil Upadhadaya, one of a handful of ASHRAE accredited Building Energy Modeling Professionals (BEMPs) in Texas, is a champion of building performance analysis, having performed energy modeling, lighting and daylighting simulations, hygrothermal simulations, and airflow simulations for over 110 projects, 70 of which are LEED buildings. Colley Hodges, one of the country's first WELL Accredited Professionals, is an architect and sustainability consultant with significant expertise in aspects of the built environment that affect human health and wellness. Our EcoServices Team operates as a private research consultant group, continuously seeking innovative ways to improve building performance via new technologies, software, and extensive study of our own completed projects. Our EcoServices team consists of LEED architects and green building consultants creating environmentally and budget friendly design that minimizes architectural footprint and encourages productivity.